Castle Hoof Boots by Castle Plastics, Inc. Finally an easy solution to aid your horse's comfort! Made of light neoprene rubber, the Castle Hoof Boot offers extreme comfort, protection and breathability for the hoof. Castle Plastics was founded by Gabrielle Serafini in 1920. He and his bride Emilia migrated from Castello di Alvito, Italy to Leominster, MA in the United States in 1911. Today, Castle Plastics is a leading manufacturer of horseshoe pads in North America. Our introduction to the equine industry was sudden, unplanned, and really accidental. One day, a family friend was observed shoeing one of his horses from his racing stable. During the process, he began to nail a hoof pad between the hoof and the shoe. From there, research and inquisition began in regards to the value the hoof pad served is assisting the horses to perform. Castle Plastics, has involved in the hoof care industry for many decades and we take pride in both the innovation and quality of all the products that we have developed and introduced to the market over the years, as well as the fact that each and every item that leaves our facility is manufactured in house. We are extremely grateful to the farriers and horseshoe supply dealers that have willingly worked with us in order to help transform ideas and concepts into the many successful products that we have available today. As always, we continue to welcome and encourage any feedback from farriers, distributors, and equine enthusiasts. Our ultimate goal is soundness for the equine athlete! So How Do I Know If My Horse Needs To Wear Pads? Deciding when your horse needs Castle Plastics’ products is a decision that almost always needs to be made by a professional farrier. It is important to note that improper use of our products will do little to help your horse and, in certain situations, can actually irritate your horse’s feet. Keeping this point in mind, sometimes it will be obvious to you that your horse is having issues with his/her feet. The horse may appear lame, or to be walking with an altered gait. Moreover, you may even notice a visible injury to the hoof, such as an abscess or abrasion. We offer products to help with all of these issues. Discussing your horse’s symptoms with your farrier will help determine which of our products will be the most helpful. Do Pads Also Help Enhance Performance Or Protect My Horse’s Hooves From Becoming Sore? Yes! Many times, a farrier may recommend using some of our pads even when a horse seems to be performing fine. This is when it is important to trust your farrier! In actuality, the majority of our pads are not used to directly treat injuries. In fact, farriers use our pads often to keep horses from becoming lame or tender footed. For instance, some horses have trouble growing their frogs, so farriers will use our cushion frog pads. Other times, horses’ feet may grow at strange angles, so degree and wedge pads are needed to fix this. At any rate, the most important thing to keep in mind is to always use a farrier who you trust and respect! Does Castle Plastics Have A Pad To Suit Every Equine Need? With our diverse assortment of products available, Castle Plastics’ pads can help virtually any horse! Farriers have successfully used our pads to treat a large assortment of hoof-related issues. Some of the most common examples are as follows: foal extensions, flat soles, pedal osteitis, poor hoof growth, navicular disease, laminitis, and stress fractures of the coffin bone. Additionally, our products are frequently used in less severe cases. Sometimes a horses may be slightly tender footed, and other times environmental factors may warrant the use of pads in order to prevent problems from occurring. In all cases, a healthy relationship between horse owner and farrier will help to ensure that all horses have what they need from Castle Plastics to keep their feet in perfect condition! How Long Will My Horse Need To Wear Pads? The length of time each horse needs to use Castle Plastics’ pads varies greatly on an individual basis. Again, this is something that can and should only be determined by a professional farrier. Several horses with a specialized injury or newly diagnosed disease of the hoof will only need pads for approximately one six-week shoeing cycle. Other horses who have a history or problematic hoof growth or, perhaps, issues with frogs may utilize our products for their entire lives! It is important to keep in mind that the use of pads does not mean there is anything wrong with your horse. Our products should not be thought of in only negative situations. Pads are a great tool for farriers to use to help all horses function at their full potential! So How Many Styles of Pads Does Castle Plastics Make? Degree/Wedge Pads: These pads are available as either full (closed) pads, or bar (open) pads. They come in many different shapes and thicknesses so farriers have many options from which to choose. There are two main uses for these types of pads. The first is to simply provide support. The second is to correct improper angles of hoof growth, which is very common. Flat Pads: Our Flat Pads are all full pads that are designed to cover the entire hoof. Unlike many of our other products, these do not have varying angles. Because they shelter the hoof, they are primarily used for protection. Some individuals use certain styles of these pads on race horses. Draft Pads: Our Draft Pads are available either flat or in various degrees. They serve the same purposes as our other products. The only difference is that they are bigger to accommodate larger footed horses. Rim Pads: Our rim are available either flat or as a degree. They can help correct angles of the hoof, as well as protect the toe. The major difference with these pads is that they are not full, so the middle of the hoof is left open when they are applied. Sno Pads: Sno Pads are some of our most widely used products throughout the winter season. We recommend that all horses being ridden during the winter months on snow and ice take advantage of these products. Our sno pads are broken down into two categories: sno rims and snoballs. Sno rims are open pads that allow the middle of the hoof to be left uncovered. The key component of sno rim pads is the hollow tube. Each time a horse steps when wearing sno rims, he/she will compress this tube. This prevents sno and ice from forming and hardening on your horse’s feet. Snoball pads work in a similar fashion. These are full pads that cover the entire hoof. Similar to the sno rims, these pads have a round ball design molded into them. When the horse steps, this ball pops inward towards the hoof. This clears any snow and/or ice that has attempted to form within the hoof. Preventing the accumulation of snow and ice around your horse’s feet is an essential component of winter safety. Therapeutic Pads: Our Therapeutic Pads category consists of the following pads: hospital, magnetic, performance, and spider. The hospital pad is intended to treat injuries of the hoof. It is a pad with a removable cover that is to be placed over the injury. Magnetic pads provide an alternative form of treatment for various diseases of the hoof. This drug free option is perfect for cases in which traditional shoeing options have failed to improve the conditions of the hoof. Performance and spider pads are made of a much harder and durable material. Performance pads are designed for the ultimate level of sole protection. Specifically, spider pads are ideal for treating quarter cracks, or for floating an injury anywhere within the hoof. Specialty Pads: Specialty Pads are composed of cushion heels, cushion frogs, egg bars, and pour pads. Cushion heels, cushion frogs, and egg bar pads are all designed to support the heels and frogs of horses. This is one of the most important parts of your horse’s foot. Protecting this area is vital to maintaining soundness. Specifically, egg bars are designed to be used with bar shoes. This pre-made shape is easier for your farrier to apply. Our pour pads are intended to be used with pour-in impression materials. This pad helps hold the pour-in materials in place and prevents them from falling out, which would require an additional visit from your farrier! Hoof Print Impak Pads: You'll love our Hoof Print Impak Pads! Hunters, jumpers, Thoroughbreds, trotters, pacers and polo ponies have all benefited from this shock absorbing material. Manufactured from a special blend of polymers, these pads not only absorb shock, but also stand up well and are able to be reset. These pads have also been used effectively for foal extensions, flat soles, pedal osteitis, and hospital plates. Impak pads are a great option for horses who are more tender-footed in general, or who simply need a little extra concussion-relief on a daily basis. 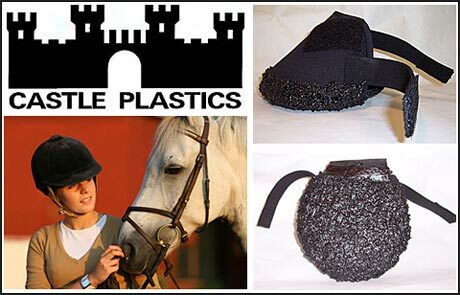 Make Sure YOUR Farrier Uses Castle Plastics For Your Hoof Pads and Order Today! Nothing is more important than the health and well being of your horse’s feet! Making sure that your horse has the best farrier who comes out on a regular 6 week basis is a great way to ensure that your horse receives both professional care and maintenance. We welcome the chance to work with your farrier to provide the best pads for every need. We have distributors all across the USA or you can call us today and we are happy to work with you!